2023b, Hubcap used, 15", 77-78, CADILLAC, ELDORADO, PAINTED CENTER, CREST AND LEAF. 2308b, USED RIM, 17X6-1/2, 5 LUG, 4-1/2", 08-10, DODGE, AVENGER, ALUM, 5 DOUBLE SPOKE PAINTED FINISH WITH PAINTED POCKETS A=MACHINED B= ALL PAINTED. 3404a, Used Rims, 15X7, 5 LUG, 4-1/2" 01-06 FORD MAZDA, B-2300, B-3000, B-4000, EXPLORER, RANGER, PAINTED SILVER, CLEAR COAT, 7 SPOKE, STEEL. 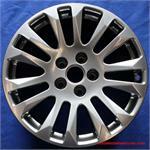 3404b, Used Rims,15X7, 5 LUG, 4-1/2", 01-05, FORD, MAZDA, B-2500, EXPLORER, RANGER, PAINTED SILVER, W/O CLEAR COAT, 7 SPOKE [R] STEEL. Price: ORDER UNDER #3636 CENTER CAP. 3656/3636, CENTER CAP USED, 07-09, LINCOLN, MKZ, MACHINED FINISH, WORDS LINCOLN IN BLACK, BLACK BACKGROUND CHROME LOGO, 5 PLASTIC CLIPS, STAR WIRE, 6-3/16" DIA FOR A 17", 8 SPOKE, GROOVE IN EACH SPOKE, ALLOY. ORDER UNDER # 3636 CENTER CAP. 4583, USED RIM, 18X8-1/2, 6 LUG, 04-10, CADILLAC, CTS, STS, ALUM, 7 SPOKE, PAINTED. Price: ORDER UNDER 4589 CENTER CAP. 4583/4589, CENTER CAP USED, 18, 04-10, CADILLAC, CTS, STS, PLASTIC WITH CHROME LOOKING LOGO IN CENTER, 2-9/16" DIA, FOR A USED ALUM, 7 SPOKE, PAINTED. ORDER UNDER 4589 CENTER CAP. 4669, USED RIM, 18X8-1/2, 5 LUG, 4-3/4", 10-11, CADILLAC, CTS, ALUM, 14 SPOKE, PAINTED HYPER SILVER. 4669, USED RIM, 18X8-1/2, 5 LUG, 4-3/4", 10-11, CADILLAC, CTS, ALUM, 14 SPOKE, PAINTED HYPER SILVER..
5439, Used Rims, 18X7-1/2, 5 LUG, 4-3/4", 10-11, CHEVY, CAMARO (CPE), OPT PZ3, 5 SPOKE, PAINTED, ALLOY. 62287/62424, CENTER CAP USED, 91-94 NISSAN 240SX PAINTED WITH CHROME NISSAN LOGO 2-1/8" DIA. FOR A 15", ORDER UNDER 62424 CENTER CAP. Price: ORDER UNDER 62424 CENTER CAP. 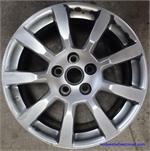 62444, Used Rims, 17X7, 5 LUG, 4-1/2, 05-06, NISSAN, ALTIMA, PAINTED FINISH, 5 SPOKE, ALLOY. 6550, USED RIM, 17X7-1/2, 5 LUG, 115MM, 02- 05, PONTIAC, BONNEVILLE, ALUM, 5 SPOKE, PAINTED BRUSHED FINISH, V CUT ON END OF EACH SPOKE. 6550, USED RIM, 17X7-1/2, 5 LUG, 115MM, 02- 05, PONTIAC, BONNEVILLE, ALUM, 5 SPOKE, PAINTED BRUSHED FINISH, HAS A V CUT ON END OF EACH SPOKE.